mathcounts notes: Find the area of the petal, or the football shape. 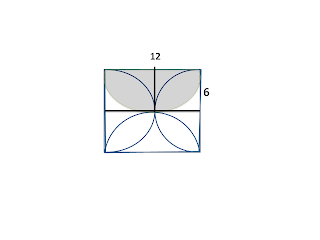 Find the area of the petal, or the football shape. Find the area of the football shape, or the petal shape. The below Mathcounts mini presents two methods. The first question is exactly the same as this one. Besides the two methods on the videos, you can also use the following methods. You can also look at this as a Venn Diagram question. 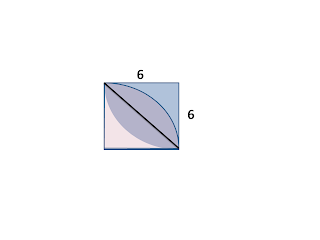 The overlapping part is C.
which is 6 x 12 minus, the area of the half circle with a radius 6, you get the two white spots that are un-shaded. Use the area of the square minus that will again give you the answer.